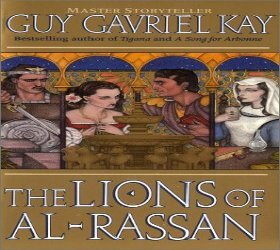 The Lions of Al-Rassan is historical fantasy fiction novel written by Guy Gavriel Kay that concentrates on relationship between three people with different religions. Jehana is Kindath (based on the Jews) female doctor, Rodrigo is Jaddite (based on Christians) captain (comparable to El Cid) and Ammar who is Asharite (based on Muslims) poet and mercenary. Love, fights, political games, friendship, tolerance the book touches all of them. Most of all, the book gives poetical side of religions conflict and the story is given more trough emotions of characters than trough actions. So, this is not typical fantasy book and can not be compared with other fantasy books, but the best is to say, The Lions of Al-Rassan is different book that can be called as fantasy for womens as many female SF fantasy fans are very appreciating all Kays books. anonymous: "From perspective of time even novel with some things came true. E-book lions of al rassan was brilliant reading for holidays." anonymous: "lions of al rassan"
Colby Story: "Here are some images and banners that you can use: https://drive.google.com/drive/folders/1gWxexdmp9wIecSU2zrjL7uIYhOUmMg_4?usp=sharing"
Solve this complex math: 6 + 2 = ?